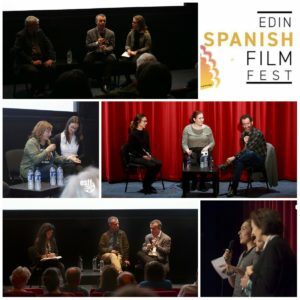 Two staff members in LINCS, José María Conde and Ramón Inglada, are coordinating this collaboration, hoping that it will continue for many more future editions of the festival. We encourage you to attend some of the screenings and enjoy the festival! 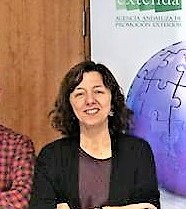 John Cleary and Katerina Strani from LINCS led the 2nd Training Module on International Cooperation Agreements and Networks, which is part of the Erasmus+ Marco Polo project (574027-EPP-1-2016-1-ES-EPPKA2-CBHE-JP), led by the University of Seville. 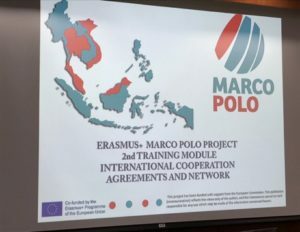 The project includes 9 partners from Spain, the UK, Austria, Malaysia, Thailand and Vietnam, and seeks to strengthen International Cooperation amongst Higher Education Institutions by establishing new mechanisms to exchange experiences and good practices, providing training to HEI staff, creating a framework for mobility of students and staff, and fostering research abilities by creating international research groups. 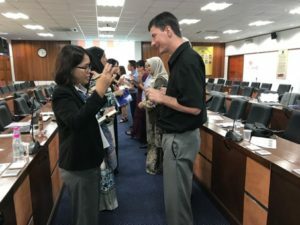 The 2nd Training Module on International Cooperation Agreements and Networks took place on 21st – 25th August at Universiti Sains Malaysia, in Penang, Malaysia. 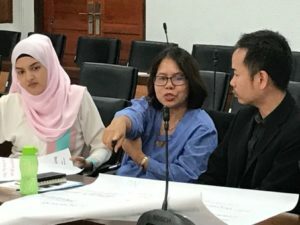 The first day was spent presenting the participating institutions: the hosts, Universiti Sains Malaysia, the University of Malaya, Prince of Songkla University, Naresuan University, Hanoi University, PTIT and Heriot-Watt University. On the second day, John and Katerina led discussions on internationalisation in the Higher Education sector and what this means for individual institutions. Differences in conceptualisations, priorities and strategies already started to emerge. The day continued with an interactive workshop on international cooperation agreements and networks and a subsequent talk by Dr Khairul Anuar Che Azmi from the USM legal office. The workshops continued on template agreements, analysing risk and developing institutional strategies for network building and internationalisation. The third day continued with more workshops on teamwork and building trust in cross-cultural teams, as well as building and sustaining virtual networks using social media. All delegates visited the impressive – to say the least – USM’s International Mobility and Collaboration Centre (IMCC). The fourth day focused on discussion and reflections on the week’s activities and drew parallels between institutional strategies. It also focused on future collaborations and included meetings with USM Heads of Schools and Departments. 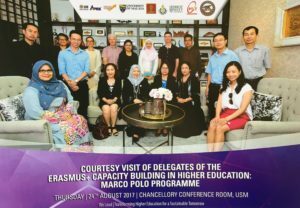 We were particularly honoured to have had the opportunity to have a meeting with the Vice-Chancellor of USM Professor Datuk Dr. Asma Ismail and discuss with her the university’s vision, priorities and opportunities for collaboration. 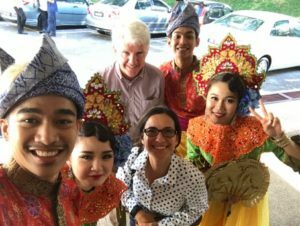 The final day continued the networking activities at a more informal basis and included a tour of Georgetown, the capital city of Penang. Georgetown is unique in its diversity and richness in culture, heritage, architecture and food. The oldest portion of the city centre is a UNESCO World Heritage Site. 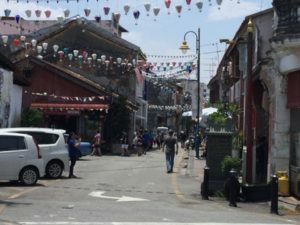 A blend of Chinese shophouses (“clan jetties”), Chinese temples, Hindu temples and Mosques Georgetown has also retained some colonial-style buildings, English street names and an Anglican church, St George’s (unsurprisingly). 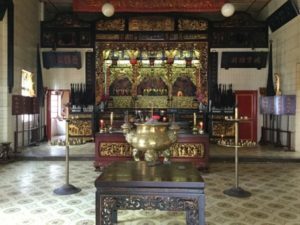 The Street of Harmony is testimony to the matchless diversity of the city. 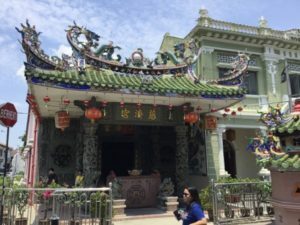 A promising project module that establishes important international networks could not have taken place in a better setting than unique Penang, in an unparalleled environment of rich cultural heritage, tremendous hospitality an and mouthwatering food. DGI SCIC virtual classes starting in LINCS ! 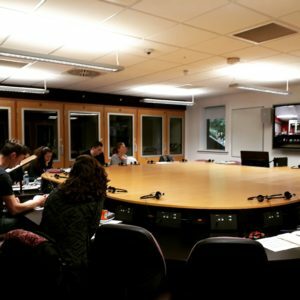 LINCS held its first virtual conference interpreting class in cooperation with SCIC today, with a select group of talented MA and MSc students. Thanks to the support of our AV team, we were able to set up the system used by SCIC to provide pedagogical assistance in interpreting training institutions across Europe. So is this the start of a new era? Is distance-teaching going to be the way forward for interpreting training, and could it replace face-to-face teaching? No quite yet: technology has its limits, and connections sometimes broke up, for brief periods. And even if there is a drive towards video-interpreting in some fields, a screen can’t give you the same feel as a live audience. Mastering nerves is a crucial part of interpreting training. It’s therefore very important for trainee interpreters to experience a real, live audience: the dynamics, logistics and overall communication change greatly, and being prepared for this is essential. But this experience was immensely useful. This is a great way to involve a range of talented trainers from Brussels for a few hours, without any plane, train or taxi journey required. 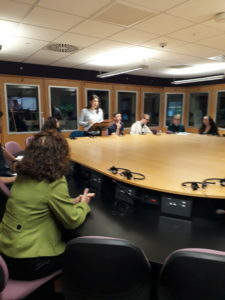 The team of professional SCIC interpreters simply connected from one of their rooms in Brussels, and LINCS students worked in the familiar setting of our large conference interpreting lab. So this type of technology facilitated an excellent training session with experienced professionals without any travelling required on either part – a clear benefit for universities located far away from the epicentre of European life, and a great way for SCIC interpreters to interact with young talents who aren’t on their doorstep, but aren’t short of skills! This experience has also been a great way to bridge another invisible gap: the DGI can seem rather distant, and almost unattainable; possibly even more so from the distant shores of Bonnie Scotland. And yet after the session, our students gladly admitted that the speeches didn’t throw them: content, pace and level of difficulties mirrored fairly what they’d been doing in class during the year. Some even commented that the pace wasn’t quite as punishing as in classes they’d had at Heriot-Watt! 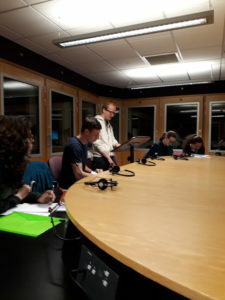 The very positive feedback, focused on a number of aspects regularly discussed in class, also contributed to their confidence: they now realise that an EU interpreting career could be within their grasp, they have a better idea of what they need to work on, and most of them are now determined to apply for the accreditation tests. 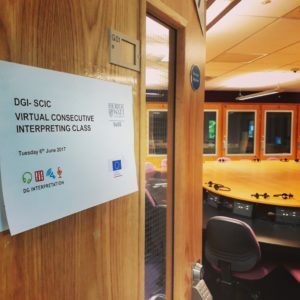 So even if virtual interpreting classes aren’t about to replace live university programmes, they are certainly an amazing way to build bridge with international organisations such as the EU, and possibly to set up more cooperation across campuses and between interpreting training universities. We’re therefore looking forward to building on this success for further virtual classes with SCIC and hopefully with partner universities abroad! For the second year running, two colleagues from the LINCS Department at Heriot-Watt’s School of Social Sciences (SoSS), Dr Maggie Sargeant and Dr Pedro Jesús Castillo Ortiz, were involved in the SCORE (Scottish Centre of Refereeing Excellence) course for football referees (2015) and assistant referees (2016), in partnership with the Scottish Football Association and Oriam: Scotland’s Sports Performance Centre, based at Heriot-Watt University. The course aims to provide a pathway for up-and-coming match officials to develop skills relevant to refereeing at the highest level of the game. In this regard, public communication skills and intercultural awareness are key in bringing Scottish referees into the international arena. Building on existing research in communication and leadership in sport, Sargeant and Castillo delivered the first communications workshop of its kind in Scottish football. Neil Gibson (Director of Sport, Performance and Health at Oriam, Scotland’s Sport Performance Centre) was delighted that participants had the opportunity to develop the kind of skills that will take their careers beyond the national context. In the first edition (2015-2016), 9 referees attended the course, learning how to deliver clear, concise and coherent messages when communicating both on and off the pitch. Best practices in dealing with how to explain the rules of the game both to players during football matches and to the media when required were highlighted as having been particularly useful by the participants in their workshop feedback. In the second edition, this season, 10 assistant referees took part in a series of role plays, communicating with match officials in international matches where issues such as racism and sexism have to be handled sensitively. They also engaged in public dialogue around the offside rule, a game-changing situation in football, where assistant referees play a key role during matches. In both editions, Dr Sargeant and Dr Castillo presented real and hypothetical scenarios for group discussion, in which referees and assistant referees have to face a diverse linguistic and cultural environment on and off the field (players, coaches, tournaments, media). Although the promising future referees and assistant referees were well aware of what is at stake in the international football sphere, this module of the course made them aware that knowledge of foreign languages, intercultural communication and dealing with a complex global media landscape are also crucial in achieving and providing excellence in refereeing. To some extent, football referees share skills and challenges with interpreters, hence Dr Sargeant and Dr Castillo’s involvement in the course, with the conviction that transferable skills can be at the heart of courses such as this taught to up-and-coming SFA referees. “If public communication skills, face-to-face interaction in multilingual environments, fast decision making and dealing with potentially conflicting parties is at the core of the training of future interpreters in LINCS, and we can successfully achieve it, why wouldn’t we apply it to football referees and other sports professionals?” Dr Sargeant and Dr Castillo explained. 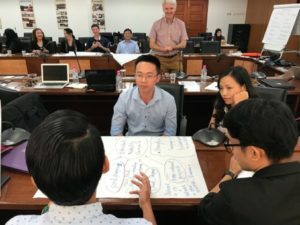 With positive feedback from the SFA organisers and the participants of the course, the involvement in training opportunities such as SCORE evidence the potential impact that key skills we research on and teach in LINCS can have, bringing other professions and industries to the top level of international excellence. We are looking forward to next year’s SCORE course and we hope to see these referees and assistant referees in the next Euros and World Cup. Four undergraduate students from LINCS were successful in their application for a competitive scholarship offered by the German Academic Exchange Service, ‘Deutscher Akademischer Austauschdienst’ (DAAD). The scholarships will enable Sarah Coats and Silvia Ramos Gonzalez (Year 2), as well as Carolyn Thomson and Christopher Rix (Year 1) to attend a 4-week summer school with a focus on German language and culture at a German university of their choice. The DAAD Summer University Scholarships are open to Heriot Watt students of *all disciplines* with an intermediate level of German. Scholarships applications open up in November each year. For more information contact the DAAD-Lektorin in LINCS, Kendra Jaudzin (k.jaudzin@hw.ac.uk). Click here to see post in BSL. On 12th and 13th January 2017, the kick-off meeting for the DESIGNs project (Deaf Employment for Sign Language Users in the EU) took place in Dublin, Ireland. The 30-month project is modeled on the recently completed Justisigns project, which was funded through the European Commission’s former Leonardo Da Vinci Lifelong Learning programme and produced a range of resources for Deaf communities, sign language interpreters and police officers relating to deaf people’s access to justice in police settings (see here for video summarizing key outcomes). The DESIGNS project is funded through the current European Commission’s ERASMUS+ Key Action 2 Strategic Partnerships, and brings together 7 partners from 4 EU countries who are renowned experts in the fields of Deaf Studies research, education and training, employment, sign language interpreting and Deaf community advocacy. The project is promoted by the Interesource Group Ireland, and the partners are the Centre for Deaf Studies at Trinity College Dublin (Ireland), the Department of Languages & Intercultural Studies at Heriot-Watt University (UK), the Deaf Studies Group at the Humboldt University of Berlin (Germany), the European Union of the Deaf and the European Forum of Sign Language Interpreters (Belgium) and AHEAD – Association for Higher Education, Access and Disability (Ireland). There is a direct link between early education, attainment of professional and/or educational qualifications, advancement into the labour market and social inclusion. Apart from financial autonomy, work and paid employment serves to develop a sense of belonging with positive mental health benefits and identification with the wider community (National Disability Authority, 2005). However, Deaf people continue to face barriers in education, employment and access to services such in healthcare, legal and social welfare settings. In a report on poverty in the Deaf community, Conama and Grehan (2001) state that Deaf people experience higher rates of poverty, social exclusion and employment. Factors such leaving school with no examination nor qualifications, inadequate support for the use of sign language has resulted in a worrying picture and 80% of Deaf adults have literacy problems compared to 25% of the population as a whole. Research and data on unemployment is under reported and inaccurate. “Deafness and hearing loss” is often used to report data, and sign language users who are Deaf is under-researched. The World Federation of the Deaf also reports that figures on (un)employment are inaccurate and difficult to quantify (Hauland & Allen, 2009). The overall aim of the project is to create research-driven, evidence-based VET and CPD training resources and exchange best practices across Europe to facilitate greater participation of Deaf sign language users in employment. The kick off meeting in Dublin involved the research consortium getting together to discuss and plan project milestones and tasks. In addition, a ‘townhall’ meeting was held in cooperation with the Irish Deaf Society at Deaf Village Ireland, to launch the project to local Deaf community members by giving an overview of various issues related to deaf people and employment and a description of the project. The event was live streamed through the Irish Deaf Society’s Facebook page, and the video can still be seen with presentations interpreted between English and International Sign. The research input from Heriot-Watt University is being led by Professor Jemina Napier and a deaf research assistant will join the team at a later date. 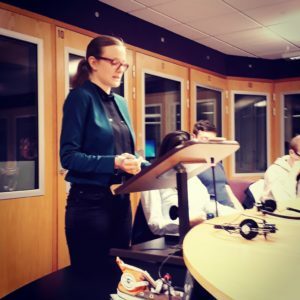 A newly arrived deaf PhD student – Mette Sommer – will be conducting research on the lived experiences of deaf people at work – so her research will also complement the DESIGNS project. 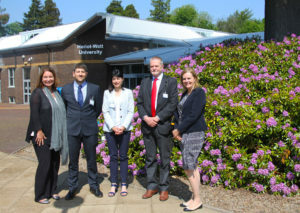 The goal will be for Heriot-Watt University to cooperate with key stakeholder organisations in Scotland, including the British Deaf Association, Action on Hearing Loss, the Scottish Association of Sign Language Interpreters and the Association of Sign Language Interpreters UK, Deaf Action’s Employability Service. A community information event will be hosted at Heriot-Watt University sometime in the coming months, so keep an eye out for information about the event and the project.